Our local library was selling off their rental DVDs this weekend, and word on the street was there was much cheap Bollywood to be had. By the time we got there, however, the masses had already wiped clean the shelves, and our choice was limited to four DVDs, one which had a young Amitabh Bachchan on the cover. Now, as we are always eager to point out, we don't like Amitabh and never, ever will. But it was nice to see a familiar face. So nice, in fact, that we spent four bucks to take him home with us. 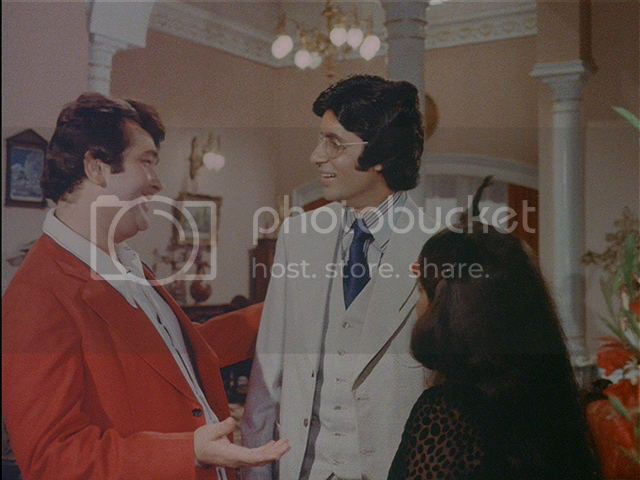 There is SO MUCH Amitabh in this movie. If he's not physically in a scene, his portrait is. And we're happy that we did! Already in the first scene, when the credits flashed over sweeping shots of Rogers and Hammerstein's mountains (the Himalayas? Switzerland? 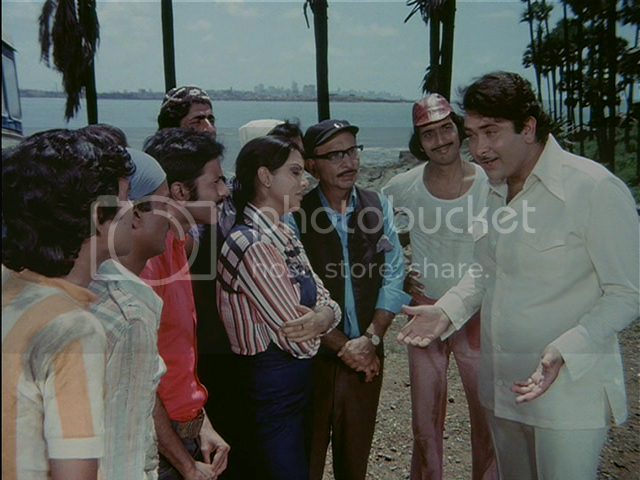 ), we saw the names Lata Mangeshkar, Mohammad Rafi, Asha Bhosle and Kishore Kumar. Then we read, "Music by R.D. Burman." Dear ones, we had struck GOLD. Sing for me! Sing, sing! God, the music is brilliant. 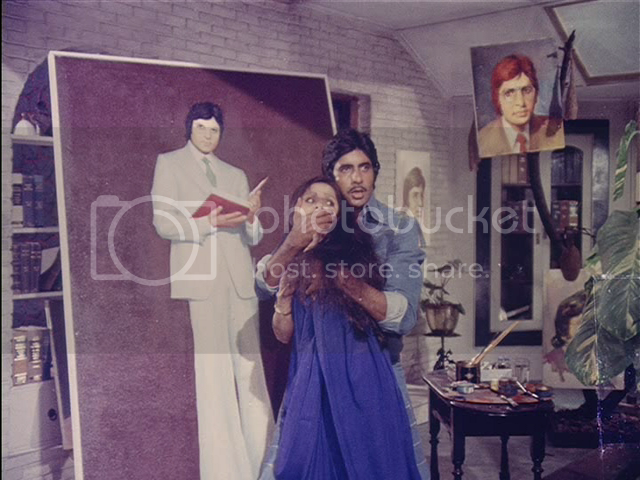 The plot: Amit (Amitabh Bachchan) and Suman (Rakhee) are in love. They spin with arms outstretched, bathed in sunlight, mountains behind them. If only they could get married, but alas, Amit promised his mother than he would delay his own joy until his younger brother, Raju (Randhir Kapoor), graduates from university. Now, Raju is a thirty-something loafer, so it doesn't look like he'll be graduating from anything soon. Amit and Suman are troubled by this, but they love Raju anyway, as he is just so affable. The three live a pleasant bourgeois existence, until Raju starts to fall in with some toughs at uni. Things escalate and soon he's in knife fights. Uh oh. The two wheels and... the third one. 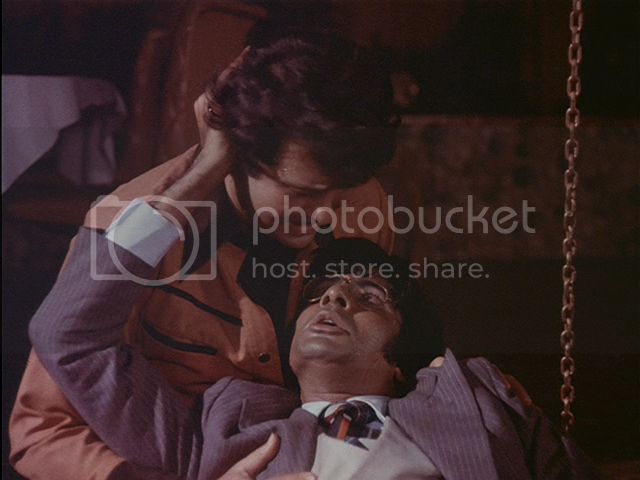 In fact, things escalate to such a degree that Amitabh is KILLED. But don't worry, Amitabh Bachchan fans. He will return. In less than twenty minutes, in fact. Grief-stricken, brother Raju realizes he's the man of the house now and so, pulling himself up by his bootstraps, he and Suman move to Bombay where he joins a local garage. One day, the mechanics inform him that, "Oh no! He's coming!" Who he? Why, the menacing car thief, Shankar (Amitabh Bachchan, AGAIN)! Once Raju lays eyes on Shankar, his heart splits in half. Apparently his brother had a doppelganger in Bombay and, of the MILLIONS OF PEOPLE IN INDIA, Raju has run into him... Do you see where this is going? Evil Amitabh is totally awesome. 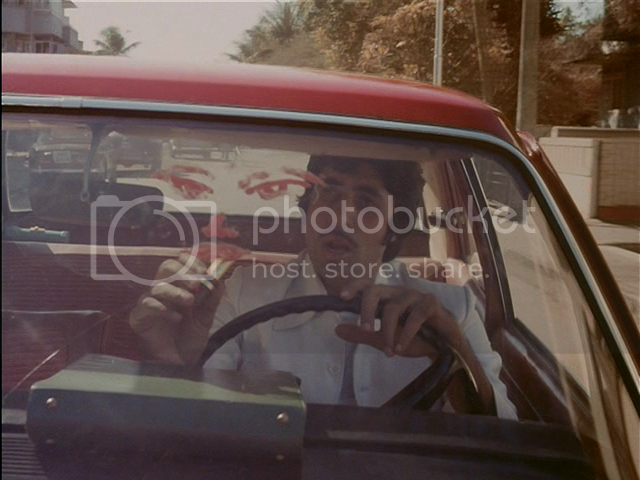 Well, obviously Raju can't help but feel a bond of fraternal affection to this random guy with his brother's face. And naturally, once Raju extends the warm hand of peace and friendship, Shankar's icy toughness melts into, "No one's ever called me 'brother' before!" Apparently a young Shankar had turned to crime for lack of friends. Poor dear. But what does Suman think of all this? Well, she's troubled for a few minutes, but once Raju helpfully burns all her portraits of her fiancee, she has no choice left but to marry Shankar instead. This decision is symbolized with great audacity by Shankar accidentally smearing his blood on Suman's forehead during the final (and surprisingly violent) showdown between Shankar and his former criminal employer. (Hindu women apply red vermillion to the part in their hair to symbolize being married.) So in the end, everyone's happy. Raju and Suman have their beloved Amit back, except he's called Shankar now. Shankar has friends, and the police have some free time. Maybe the most fascinating thing about this movie from a Film Analytics point of view is the puzzling presence of overt Christian themes. 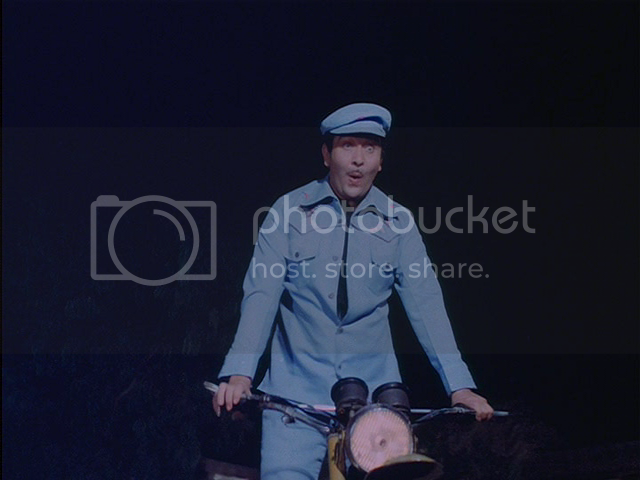 Apart from the death and resurrection of Honest Amit, there are explicit references to Shankar the Car Thief being a prodigal son. Even the climactic showdown takes place in the ruins of a Christian church, while a statue of the Virgin Mary looks down upon us. These are all just a little too obvious to be ignored, but we at the PPCC can't make heads or tails of it. What does it meeeeean? Whatever it means, there were some moments in this movie which we enjoyed tremendously. 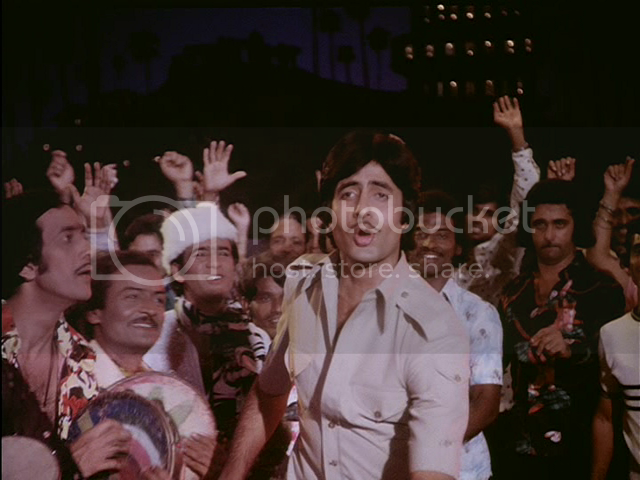 The moment when Amitabh Bachchan swings his gangly limbs and sings, Oh, I wonder how it happened to me one day/I lost my way, even as I walked the path, with the lovely, gentle melancholy of it all juxtaposed against the twirling colors; why, we dare call this one of those elusive moments of Transcendental Bollywood. Just as Arun Krishnan of Cutting Chai once commented on his excellent podcast, Bollywood has a habit of moving suddenly and unexpectedly from the ridiculous to the sublime. No comment about the acting. Suffice to say Naseer is nowhere to be seen. The prodigal moves us through song.